Dontnod are best known for Life is Strange – a game that shows off the studio’s strength as storytellers. But their first game was Remember Me, a third-person combat-focused action game set in a dirty sci-fi world. 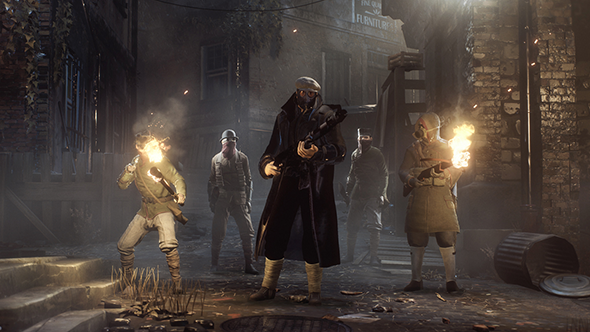 At a distance, Vampyr looks like a combination of these two sides of the studio, offering rich stories of down-and-outs in London as well as frantic combat to get your blood pumping. Unfortunately, from the two hours I played at a recent preview event, it appears Vampyr doesn’t live up to either of Dontnod’s previous efforts. 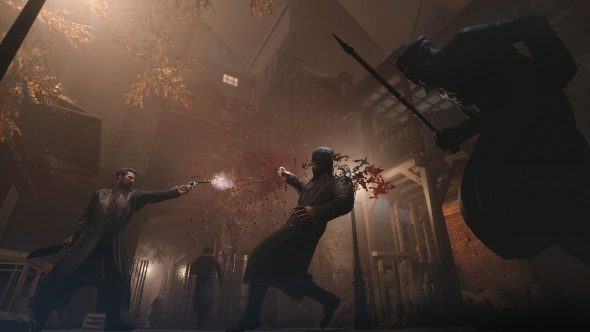 Here’s more on how Dontnod made Vampyr’s city and web of consequences. Set in the wake of the First World War, Vampyr has you play soldier-turned-doctor Jonathan Reid. That career switch is only the first of Reid’s transformations, though, as just before the game begins he is turned from a human into a vampire. Confused by the new thirst for blood, you help Reid to understand what he has become and how the change took place. Vampyr is unsatisfying from the start. For a game that has been pitched as one of choice and consequence, where you interact with a whole city of people, choosing who lives and dies to sate your thirst, it is disappointingly linear. You are hunted through dark, empty streets that may as well be enclosed corridors for the lack of opportunities for expression and interactivity they offer. Granted, there are narrative reasons for the streets to be so empty – London is heavy with Spanish flu and there is a murderer on the loose who is draining his victims of blood – but that doesn’t make the hollowness of the capital city any less noticeable. The only people you encounter in the smog-filled streets are characterless vampire hunters and blood-starved vampiric creatures who exist only to be killed by you. There is no talking to them or avoiding them. This wouldn’t be such an obvious blemish if it weren’t for the shallow combat. Fighting is straightforward: you can have a main-hand weapon and an off-hand weapon or a single, large double-handed weapon. I mostly found crude melee weapons – machetes, axes, and knives – but one useful off-hand weapon that came to hand was a stake – a few punches with that would knock my enemies to the floor, stunning them. Once an enemy is on their back you can tap a button to hoist them up and drink their blood. That does a little damage but it also fills your blood bar, which you can expend as more powerful vampiric abilities, such as throwing a harpoon of blood at a nearby foe. I found Vampyr’s combat too rough to be much fun. My attacks didn’t appear to combo, so the animations repeated without flow, becoming awkward and dull. The stake stun was useful and introduced nuance to fights but even that is a matter of repeatedly hitting your enemies with the same attack until they fall down. Combat is clearly a core part of the game because all of the skills you can level up related to it. Though, even the skill tree lacks thrill: besides a few new attacks, like the blood harpoon and a sweeping claw attack, they are all made up of invisible numbers – a 5% increase to your blood bar, a 20% buff to your health, and so on. Doubtless those increases are useful, but it looks like you will be able to unlock all the combat abilities relatively quickly, and then everything after that is simply numerical improvements. Again, I only played the first two hours of Vampyr, so there may be some radical change to how combat works later in the game, but if it continues in the same vein it will pale in comparison to other combat-focused games, including Dontnod’s own Remember Me. 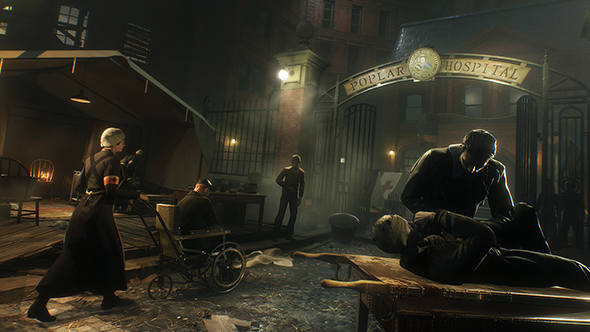 After fighting through a number of London districts filled with vampire hunters, I finally came to a hospital where the game Vampyr was promised to be when first announced started to reveal itself. The hospital hub is full of people you can talk with, learning about their lives and – depending on your proclivities – letting you get to easing their pains or draining their blood. So long as your level is high enough, you can drink the blood of any character in the hub area, killing them off in return for a healthy dose of XP. The option to mesmerise a character sits temptingly in the top left of the screen whenever you talk to them, tapping that lets you lead them away into a dark corner where you can turn them into a plasma smoothie. However, while you can kill anyone you want at the first opportunity, if you talk to them and better their lives then they will give you a greater XP bonus when you drain them. In a previous demo, Dontnod used the example of a father who had fallen out with his son since returning from the war. If you can heal their relationship then you will better their lives and, as a result, get a juicier glug of XP when you kill him. You don’t need to kill anyone if you don’t want to, but you will be left weaker as a result, making the game’s combat harder. So, if you are struggling to get through an area stuffed with vampire hunters or deranged beasts then the pressure on you to kill off a couple of tasty humans increases. Killing off other characters won’t just hurt your conscience, though: it will destabilise the district, attracting the attention of vampire hunters and making the place less safe for you. Something to keep in mind when you are eyeing up that patient’s tasty throat. After my time with Vampyr I left with the sensation that the game is divided. While your interactions with London’s citizens have an affect on combat – in that you can raise your level by killing people and drinking their blood – the two parties don’t weave together well. Many games create a dichotomy between the characters you interact with and the mindless enemies you kill. But in Vampyr that dichotomy is not so comfortable. This is a game that puts stock in a story of a man becoming a monster; it asks you to see both sides of him and the conflict between them. Having a black-and-white system that depicts characters who possess humanity on one side, and street thugs who do not on the other, is jarring. Reid considers his murder of one of the supposed innocents a monstrous act but he is left unconflicted by killing a string of human vampire hunters only moments before. 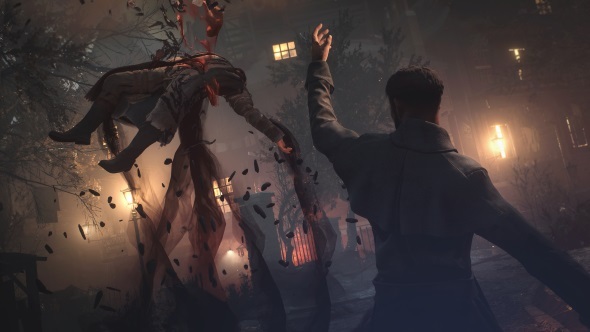 While Vampyr is a game about internal struggle it seems too much of that tension lies between its systems.